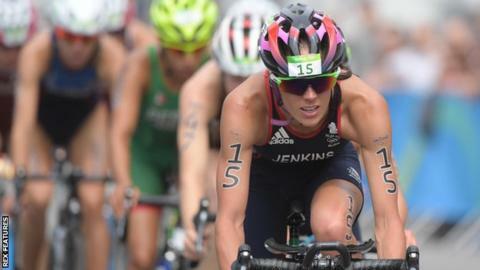 Two-time world triathlon champion Helen Jenkins is aiming to return to the sport at the 2018 World Series. Jenkins, who gave birth to her first child in August, is back in training and targeting the fourth leg of the series in Leeds in June. "I'd love to go and race well in Leeds," Jenkins told BBC Radio Wales' Friday Night Social. "There's such a good atmosphere. The UK crowds are amazing with triathlon and it would be really good to race there." The 33-year-old returned to light activity just weeks after the birth of her daughter, Mali, and has now stepped up her training as she prepares to return. "It'll be a really gradual process but I'm not looking to race until next year so I have plenty of time and I want to make sure I do it right and avoid injuries," she said. The 2008 and 2011 World Champion, who has competed at three Olympic Games, has the long-term goal of racing at the 2020 Games in Tokyo. "I'd love to go to Tokyo in 2020 and it's in the back of my mind and it motivates me," Jenkins said. "A medal at Tokyo would crown everything but I've been to three Olympics and have been sick at two and injured at one, so know how hard it is to get it right on the day. "But at the moment it's a dream to go and to win a medal would be amazing but I know how hard it is to do that." Jenkins, though, is content with her decision not to compete at next April's Commonwealth Games on the Gold Coast. "Taking the Commonwealth Games off the table I think will help me not to push too hard," she said. "I'd love to go to the Commonwealth Games again but if I am fit in April and I enter a race and get an injury and pull out then I won't be affecting anyone."